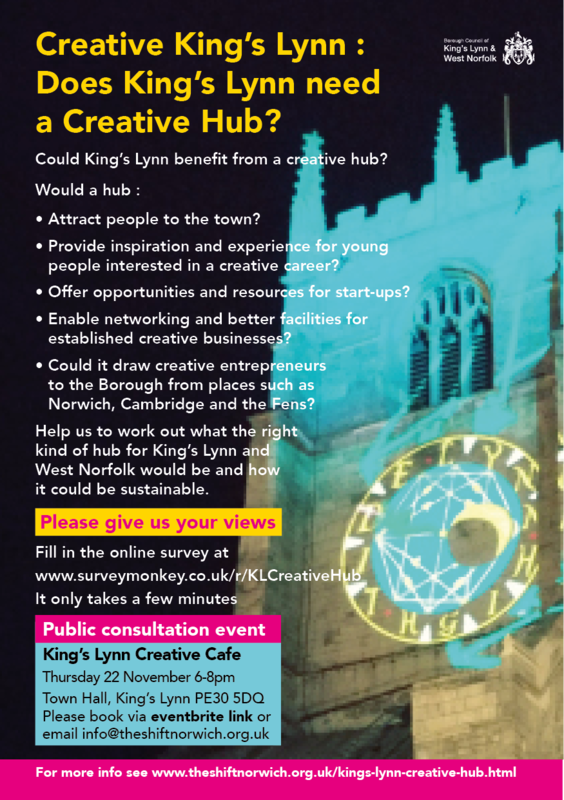 King's Lynn Creative Hub - The Shift Norwich – Culture, arts events, cultural tourism, place-making, audience development, design, arts marketing, engagement, projects, digital, advice...what are you looking for? Culture Shift is working as part of a consortium with Hudson Architects, Greenwell Consulting and Urban Delivery (The Norwich Consortium) on a feasibility and options study into the possibility of a Creative Hub in King's Lynn Norfolk. We are starting with a blank canvas as the brief is quite open – what kind of hub will work long-term for King's Lynn, be self-sustaining, providing a way for creative people to connect and work together and to enhance the development of skills and earning potential for creative businesses of all kinds. We have formed this consortium specifically for this contract although we have worked together in different combinations in the past. Our approach is based on Who, Where and How questions. Marion will be leading on the ‘who’ by finding out who is interested in a hub, who are the potential users, what is the need in King's Lynn and West Norfolk. Hannah will focus on the ‘where’ by looking at buildings, sites and possibilities for use of existing buildings or new build. Erika will be researching comparable examples of creative hubs and how they are run and leading on recommendations for the best legal and organisational structure for a hub, which could be anything from a network to a full purpose-designed building. Simon is an expert in costs and financial viability of built schemes and regenerations of sites and buildings so he will guide on financial viability. The initial work will be a through ‘mapping’ of King's Lynn and area, to find the uses and potential users. To this end we will be making phone calls and visits to people in King's Lynn, either individually or in groups. And asking lots of questions! ​Meanwhile, please feel free to contact us by phoning or emailing Marion Catlin at info@theshiftnorwich.org.uk Telephone 07946 261651 or filling in the contact form on the right. In order to help us understand what people need in King's Lynn, we have created a short survey. We would be grateful if you would fill it in whether you are a 'creative', potential user or just have an interest from a public point of view, live in King's Lynn or further afield. It will take just a few minutes to complete. We also welcome your input from any perspective - please get in touch via this form if you have something to say or would like to speak to us.